With an additional external probe connection, the testo 175-T2 temperature data logger provides a further temperature measurement option. The data logger is attached to the wall to monitor air temperature, for example, and the separate probe is placed by the goods. 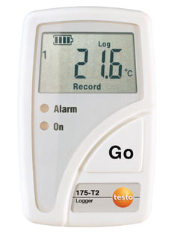 testo 175-T2 provides information on the interrelationship of ambient and product temperature.